Back in 1989, the concept of the B-side was still alive and well. At that stage, I was buying all my singles on 7" (with the rare 12" purchase), so I'd listen to what was on the other side of the vinyl record and occasionally be pleasantly surprised. Mostly, however, I'd understand why the song in question had been relegated to B-side status. This week in 1989, a song entered the ARIA top 50 that owed at least some of its chart success to a B-side. And not just any B-side - a cover version of a well-known song that wasn't actually included on every format released. At number 1 this week in 1989, New Kids On The Block made it three weeks in a row as chart champs, but it looked like their time on top was about to come to an end with Prince jumping into second place with "Batdance". Meanwhile, Simply Red, who had been steadily moving towards the summit, were pushed back to number 4 with "If You Don't Know Me By Now" - their effort to reach number 1 seemingly over. But, appearances can be deceiving, as we'll discover in a week's time. Last week, we saw as Milli Vanilli made their ARIA top 50 debut - and as we all know, the lip-syncing duo would go on to win the Grammy Award for Best New Artist in 1990. Here is one of the other nominees they beat - another duo, but one with a very different sound. Comprised of childhood friends Amy Ray and Emily Saliers, folk act Indigo Girls fit right into the trend for women with guitars in the late '80s (see also: Tracy Chapman, Suzanne Vega, Melissa Etheridge). Their biggest chart hit until a collaboration with Pink on "Dear Mr President" some 17 years later, "Closer To Fine" featured Irish band Hothouse Flowers and peaked in Australia five places lower than in the US. Their breakthrough hit, "Keep On Movin'", had done very little in Australia, so it was hardly surprising when this follow-up - a UK number 1 - didn't do much better. 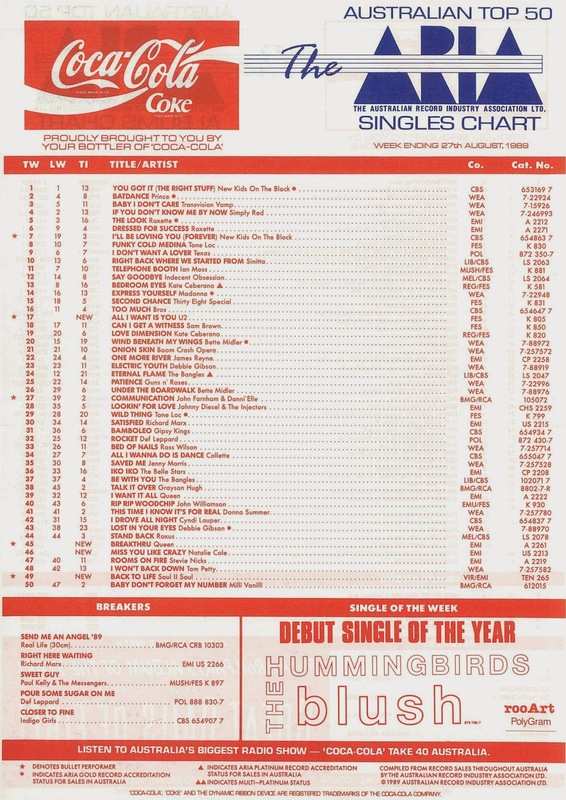 Soul II Soul did, at least, manage to break into the top 50 with what was one of the defining dance records of 1989. "Back To Life" had started out as an a cappella track on the Club Classics Vol. One album before being remixed for the single release. The "However Do You Want Me" subtitle applied to the mix which had that lyrical hook added to it - and it was that mix which got all the attention. The a cappella version, meanwhile, would go on to be sampled for years to come in dance tracks from 1991's "Anthem" by N-Joi to 2013's "What's Going On?" by Monsieur Adi featuring A*M*E.
Typically, Australia didn't get it. In fact, I didn't quite get it - and I even bought the 7" single of "Back To Life" on a whim, but it took me a couple of years to fully appreciate the song. Still as fresh today as it was 25 years ago, the track should've been Soul II Soul's biggest hit here as it was in Britain - instead that title went to 1990's "A Dream's A Dream". We'd last seen Natalie Cole the year earlier with her top 5 cover version of "Pink Cadillac", and while this big ballad made the US and UK top 10, Australia was relatively unmoved. The lead single from Natalie's Good To Be Back album was written by three heavyweight songwriters - Gerry Goffin, Michael Masser and Preston Glass, who between them had composed such classics as "Saving All My Love For You", "We Don't Have To Take Our Clothes Off" and "Nothing's Gonna Change My Love For You". Previous single "I Want It All" had returned Queen to the Australian top 10 but this follow-up could only manage a single week at this peak position in the top 50. More remarkable is the music video for "Breakthru", which was actually filmed on a moving train. These days, it'd just be done with CGI, but in 1989, the four members of Queen were insured in case injury arose from the relatively risky shoot. You wouldn't think U2 would need to rely on a B-side to score a big hit - and chances are "All I Want Is You" would still have performed well without the Irish band's version of "Everlasting Love". The Rattle And Hum ballad is, after all, one of their signature tunes. Then again, it was the fourth and final single from an already successful album - and we've seen many times before how singles that'd been big in other parts of the world faltered here since an artist's fans already had the album. So without a doubt, U2's spin on "Everlasting Love" had some impact. It received copious amounts of airplay at the time and, when fans wanting to buy it realised it wasn't the B-side to the 7" version of "All I Want Is You", the record company was forced to repackage the record with a bonus cassette containing the remake, which was found instead on the 12" and CD single versions. For me, it was a great version of a song I'd discovered the previous year when German pop star Sandra released her own take on the track, which had originally been released in 1967 by Robert Knight and remade multiple times ever since. Next week: an influx of new entries, including one of the year's drippiest ballads, an Australian spin on British indie guitar pop, another song about drugs and the latest Batman-related release. I haven't heard the Indigo Girls song in ages. I forever associate them with the tag "dykes wiv guitars", after it was sarcastically used to describe their music in a Tori Amos fanzine article, in reference to how the music press loves to pigeon-hole artists. I never knew Hothouse Flowers performed on the track too. I was pleasantly surprised to see Soul II Soul in the top 50 this week, but of course it was quite a brief stay initially. Yet again, ARIA neglected to print the full song title (or credit) on the chart, despite there being room. J.T. and the Big Family's 'Moments In Soul' also samples it... the ultra-low budget music video I uploaded to youtube is periodically blocked, then permitted, then blocked again (currently it's blocked), curiously. I was puzzled for years why 'Back To Life' magically re-appeared in the top 50 about 6 months later. But then it clicked a few months back that it may have had something to do with it being nominated (winning?) a Grammy... at least I think it did from memory. Clearly Australia couldn't (almost) embrace something relatively new until the American music industry approved of it first, much like k.d. lang's 'Constant Craving' a few years later. I bought the 'Back To Life' cassingle in 1990, but had to order it in as none of the local shops had it in that format. There was a time when rage aired 'A Dreams (sic) a Dream'/'Get a Life'/'Back To Life' back to back in the top 50; presumably because all 3 were being sold together as a single vinyl 'unit', while 'A Dreams A Dream' was in the chart. Perhaps this pack helped boost 'A Dreams A Dream' up the chart. 'Miss You Like Crazy' seemed to take ages to crack the top 50 - it was in its 10th week in the AMR top 100 by this point. I downloaded 'Breakthru' in 2011, having not heard it probably since 1989. I'd forgotten how train-y the rhythm section sounds, so it makes sense they'd shoot the video on a train. 'Everlasting Love' also received a tonne of airplay in Melbourne. 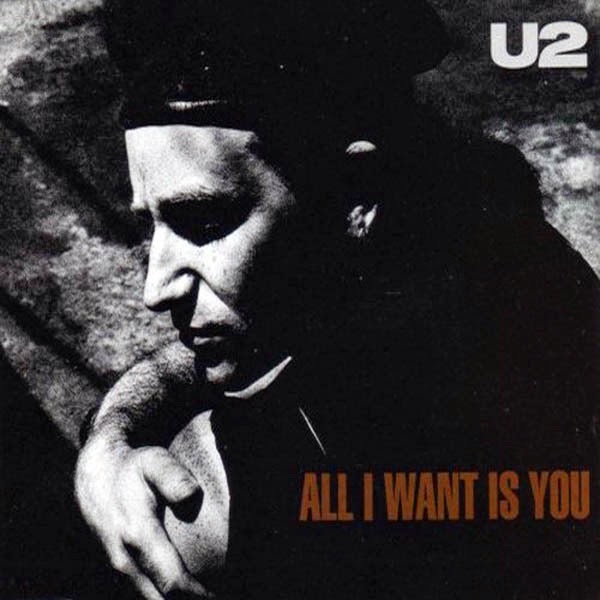 I didn't realise for some weeks that it was the b-side of 'All I Want Is You' - probably because I'd never look at any U2 releases in the shops. I did wonder though, why this new track of theirs (which I didn't know was a cover at the time) wasn't in the chart, because it seemed almost inescapable on radio. So what was on the the B side to the 7" of 'All I Want Is You'? Why didn't the record company just replace it with 'Everlasting Love' on the B side rather than packaging it with a cassette? Strange. I do like their version of 'Everlasting Love'. I didn't mind 'All I Want Is You' in the early days, but it just got so dreary and went for too long, a bit like 'November Rain'. I also like Gloria Estefan's version of it, which I think she released in 1995? I love Natalie Cole's 'Miss You Like Crazy' and couldn't understand why it only went Top 40 here, at least I got on board with the Brits and American's on this one. Good question - and I did mean to mention that. The 7" B-side was another cover: Unchained Melody. From memory, didn't the Aria chart start printing it as "All I Want Is You/Everlasting Love"? No, it only appeared as All I Want Is You until it fell out of the top 50 at the end of the year. I counted it as a double A-side for my own chart purposes - and Everlasting Love is the only reason why it made it into my top 100 for 1989 since I don't really like All I Want Is You. Too dreary. I love "All I want is You". The song sounds quite amazing with the orchestral sounds toward the end. U2 were brilliant. I also like their cover of "Everlasting Love", cheery sounding.